The sun could be the world's leading electricity source by mid-century with the amount of new photovoltaic (PV) panel installations soaring at 100MW daily, according to a pair of new reports. The reports, issued by the International Energy Agency (IEA), stated that by 2050, PV panels could produce 16% of the world's electricity, while solar thermal electricity (STE) is on track to produce 11%. Solar thermal electricity is created by concentrating the sun's rays to produce steam, which then turns a turbine. Photovoltaic panels capable of producing 137 billion watts (gigawatts) of power have been installed worldwide since the end of 2013, according to the IEA, a Paris-based agency that advises on global energy consumption. Perhaps just as important, solar power could reduce carbon dioxide emissions by more than 6 billion tons over the next four decades, the reports state. Rooftop solar panels will account for half of the world's solar PV installations because as a distributed energy source, the technology is "unbeatable," the report said. In the U.S., solar power capacity for producing electricity has grown six-fold since 2010, according to the Energy Information Administration (EIA), a federal agency that provides information about the nation's energy production across all markets. Meanwhile, the IEA's report indicates the cost of solar power worldwide is expected to drop to four cents per kilowatt hour (kWh) by 2050. In the U.S., electricity costs about 13 cents per kilowatt hour for residential power and seven cents for industrial power. IEA Executive Director Maria van der Hoeven stressed in a statement that her agency's two reports do not represent a forecast. As with other IEA technology roadmaps, they detail the expected technology improvement targets and the policy actions required to achieve those goals by 2050. However, van der Hoeven noted that the cost of solar system hardware is rapidly declining. "The rapid cost decrease of photovoltaic modules and systems in the last few years has opened new perspectives for using solar energy as a major source of electricity in the coming years and decades," she said. "However, both technologies are very capital intensive: almost all expenditures are made upfront. Lowering the cost of capital is thus of primary importance for achieving the vision in these roadmaps." Rooftop solar panel installations could cut utility profits by 15% or more over the next eight years, according to the federally funded report (download PDF) that studied two prototypical U.S. utilities -- one in the Southwest and the other in the Northeast. The report, from the Office of Energy Efficiency and Renewable Energy under the U.S. Department of Energy, predicts that rooftop solar panel installations will grow from 0.2% market penetration today to 10% by 2022. Using that scenario, the analysis found that shareholder earnings fell by 8% for the Southwest utility and by 15% for the Northeast utility using the 10% photovoltaic (PV) rooftop panel market penetration assumption. However, earnings fell by as much as 13% and 41%, respectively, under certain other conditions. Several technologies are poised to improve the efficiency of photovoltaic cells, the technology that turns the sun's rays into electricity. Currently, silicon-based PVs have an efficiency rating of about 20%, meaning 80% of the solar radiation that hits a rooftop panel is lost. MIT, meanwhile, published a report on a new a material that could be ideal for converting solar energy into heat by tuning the material's spectrum of absorption just right. "It should absorb virtually all wavelengths of light that reach Earth's surface from the sun, but not much of the rest of the spectrum, since that would increase the energy that is reradiated by the material, and thus lost to the conversion process," an MIT press release stated. The material is a two-dimensional metallic dielectric photonic crystal and has the additional benefits of absorbing sunlight from a wide range of angles and withstanding extremely high temperatures - up to 1,000 degrees Celsius. An artist's rendition of a new material that MIT researchers say would be ideal for converting solar energy to heat by tuning the material's spectrum of absorption to include most wavelengths. The omnidirectional material would eliminate the need for expensive, motorized solar trackers. The new material first converts the sun's energy into heat, which then causes the material to glow, emitting light that can, in turn, be converted to an electric current. Perhaps most importantly to the cost of a solar energy system is that the material can also be made cheaply at large scales, MIT stated. Since the material can absorb sunlight efficiently from a wide range of angles, "we don't really need solar trackers," said Jeffrey Chou, one of nine researchers who created the material. Solar trackers are what move solar panels installed in a large field in the direction of the sun to maximize power production. MIT is not alone in developing new, more efficient photovoltaic materials. Ohio State University announced what it's referring to as the world's first solar battery. The research, published in the peer-reviewed journal Nature Communications, combines a battery and a solar cell. 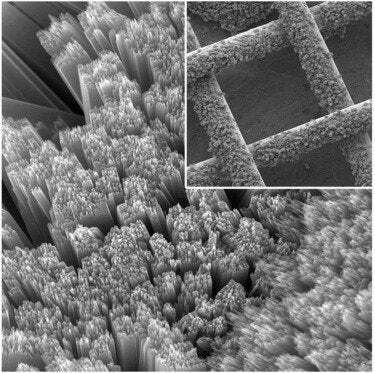 A microscopic look at the mesh material created by Ohio State University researchers that they say allows photovoltaics to be combined with energy storage. The device works by using a solar panel created with a mesh material that allows electrons to pass on to a battery electrode. The light from the solar panel and oxygen play a part in a chemical reaction that charges the battery, according to Ohio State. Yiying Wu, a professor of chemistry and biochemistry at Ohio State, said the photovoltaic/battery combination would reduce the cost of solar power systems by as much as 25% over time. "The state of the art is to use a solar panel to capture the light, and then use a cheap battery to store the energy," Wu said in the report. "We've integrated both functions into one device. Any time you can do that, you reduce cost."